I have found that very few people are making use of the Canon 550EX's wireless strobe functions. Being a former Nikon shooter I have always associated Canon strobes with disastrous results. 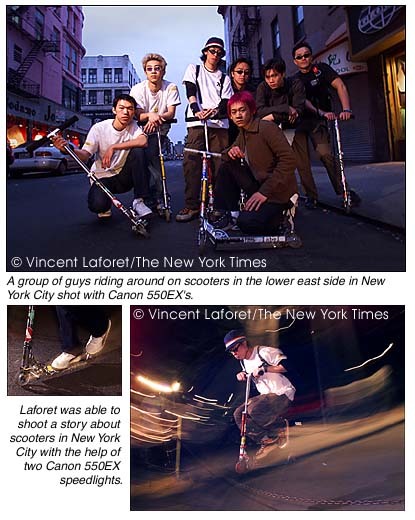 I could always tell the Nikon shooters from the Canon shooters when looking at film a few years ago. So I was skeptical when I switched over to the Canon speedlight system - and even more so when I first tried out the ETTL wireless function. The results are stunning and have turned me into an instant convert. Although you will always want to do a little fine tuning, Canon's Wireless Flash Photography system is probably the best wireless TTL system out there. And with the ability to preview the results instantly with a digital camera - it offers every photographer unlimited creative possibilities. What I should stress is that the wireless ETTL doesn't necessarily allow you to do anything you couldn't do before - you could get similar results with an series of manual Vivitar strobes - but you can leave that flash meter, off-camera shoe cords, slave units, etc. behind. Just set one of the flash as the "master" flash (on the base of the flash, just above the hot shoe) and then either hold the second strobe (set to "slave") in your hand, or place it anywhere from 30-50 feet away and you're ready to rock. There are also four channels so you won't be setting someone else's strobe off or vice-versa, and you can use up to three strobes at a time. Right out of the box, you'll find the strobes offer amazing results. 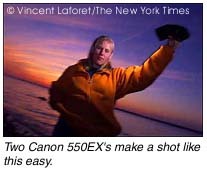 The first example is shooting a portrait at sunset. 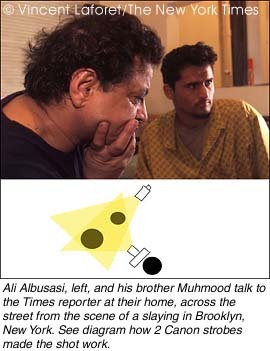 This is a pretty straightforward technique - to have someone else holding the strobe. I asked my friend and fellow photographer Robin Shotola to hold the strobe in her left hand. I dialed her strobe up 1 and 1/2 stops (the slave unit) and dialed the strobe on my camera down 3 stops, exposing for the sunset a 1/30th at around f11. The strobes were right on - every time. This is how I most commonly use the two-strobe setup. I have the main master slave on my camera dialed down two to three stops so it basically just fill-flashes, and the secondary strobe as the main light source often dialed up one to two stops. You can also chose to turn off the master flash altogether by the way, and basically you can shoot holding the other flash in your hand in a manner similar to using an off-camera flash cord, but without any cords! To do so, press the button until you select the little flash icon. Then press the <+> or <-> button to set the master slave ON or OFF. The master flash will still send the wireless signals, but will not fire when you take the pictures, only the one or two slave flashes will fire! Now you could probably get this picture with other systems, but this was done in a very fluid fashion, without any cords, and flash meters - and that's the amazing part. You can get stunning results very quickly and on the move. Add a little gel onto your strobe and suddenly that subject in the background pops out more due to what looks like a natural red light coming out of a bookcase for example. This is especially useful when you're working in cramped quarters, where you can't have cords all around, or when things are moving too quickly. I have gone to press conferences for example and just placed a strobe down on a shelf somewhere and left it there as I move around the room to take portraits. You could also carry a magic arm with a strobe at the end of it, clamping it down almost anywhere. A common situation we all face is coming into dimly lit rooms without our studio gear. Straight on flash looks horrible, and even off-camera strobes don't always cut it. The next situation is your basic "reporter interviews two subjects in a small room." Recently I photographed two men talking to the reporter about their colleague who had been killed in their bodega that morning. Ambient light was about 1/4 of a second a 2.8 at 800 ASA - a disaster for digital cameras. Bringing up light boxes or stands was out of the question. Yet I had two 550 EX strobes, and wireless flash technology to save the day! I simply plopped down a strobe to the right of my frame, almost flashing right at me, setting the slave to +2 stops. The on-camera strobe was set to +1/3 - (my experience is that ETTL tends to underexpose so I often dial them up.) What you get is a nicely lit picture, with no diffusion on the strobes, no cords, and little hassle. And remember the room was almost pitch dark. 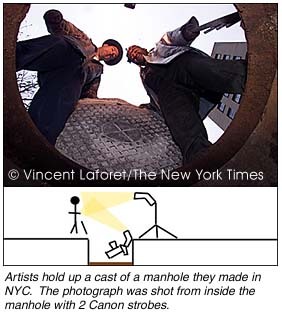 A recent assignment I had was to shoot two artists who make plaster molds of manhole covers in New York City. Naturally I thought the best angle to shoot them was from within a sewer hole, looking up. So after 2 hours of looking for a manhole cover that we could open, and one that was deep enough, we threw a ladder down (in a very active sewer!) and down I went. I had the master strobe on camera to light the edges of the sewer hole, and above I had a slave strobe on a tripod. I made sure the red plastic sensor of the top strobe was facing the strobe below and the results were very consistent once I had found the correct exposure compensation to dial into each strobe. You can also assign different IDs to the strobes, and change lighting ratios as you shoot - but I'll let you read the manual if you want to do that. I tend to simply dial up or down each strobe using the exposure compensation function. Once you get it right, it tends to give you very consistent results. With the EOS3 you can hold down the depth of field preview button and a series of bursts will go off from all the strobes to give you a preview of the light and where the shadows fall. Once again, with simply two strobes, no wires I was able to get a fairly good result. Could I have used cords? Probably, but the reality is that we were in the middle of an active street with little time - any cop who saw us would most surely intervene. So using two small strobes, I was able to climb down on the ladder, make one or two quick exposure compensation adjustments on each strobe and in less than 10 minutes we had our pictures. With strobes, cords, flash meters, Polaroids you could easily quadruple to time it would have take to get such a result. I also add an orange gel on the top strobe to give the overcast day a little color. Another advantage of this system is that you can finally find something for that reporter to do: be a moving human stand! The "Razor" scooters are all the rage and I had an assignment to illustrate a feature on them and the kids who ride them. For most of the shoot I had the reporter held the strobe off to the side and in I also shot with the off-camera strobe just sitting on the grass. Once again, the main strobe was dialed down two stops so that it was only filling in the shadows, and the slave strobe was dialed up one to two stops. In the portrait of the teenagers I made, I also underexposed the ambient light by a full stop to give it a blue cast and make the subjects stand out more. away from this - but I'm sure some of you will find uses for it. You CAN use the stroboscopic effect (in manual not ETTL) with slave units. The effective range indoors is 15m or 49.2 feet; outside it can become limited to 10m or 32.8 feet. Press the pilot lamp (test firing button) to see if your slave is responding before you start shooting, or just fire off a few frames. Don't be afraid to use slow shutter speeds and mix in ambient light, a technique I used during the scooter shoot (the slave strobe tends to mix right in, looking like a natural light source). In this case I simply held the slave strobe off to the top right of the frame, the main on-camera strobe was turned off, and I swirled the camera around in the direction of a light bulb on the ceiling in a three-second exposure to get the swirl effect. Have fun!